Samantha Wheeler has always had a passion for service. She has long dedicated herself to charitable endeavours as she serves as a board member on the True North Youth Foundation. Sam was born in Edina, Minn. and grew up in the Twin Cities in Minnesota. She had a passion for language since an early age and translated that passion into studying Spanish throughout her schooling. She would earn a Bachelor of Arts degree in International Relations with minors in Mandarin and Marketing from the University of Minnesota. Sam’s commitment to charitable events goes back to her time growing up. She’s dedicated her time to many endeavors, specifically those focused on children and animals. She has volunteered with Headstart, a children’s program in Minnesota, and the Y-buddies program at the YMCA while she was at university. Sam’s graciousness continued as a member of the Boston Bruins wives and girlfriends charitable events and when Sam and her husband Blake arrived in Winnipeg in 2011, they continued with their giving spirit. Sam was instrumental in creating the charity calendar with the Winnipeg Jets players along with dogs from the Winnipeg Pet Rescue Shelter. 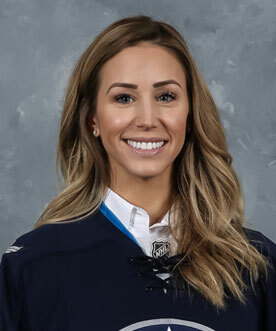 Sam, along with the other Winnipeg Jets’ wives and girlfriends, also created Holiday Cards with proceeds benefiting the CanDo People in Manitoba and various other charitable events. Sam also volunteers her time with the Winnipeg Jets Hockey Academy. Sam, along with her husband Blake, are dedicated parents to Louie and Leni and she enjoys spending her spare time playing on the Winnipeg Jets’ wives and girlfriends rec hockey team.